A spectacular, early flowering variety. 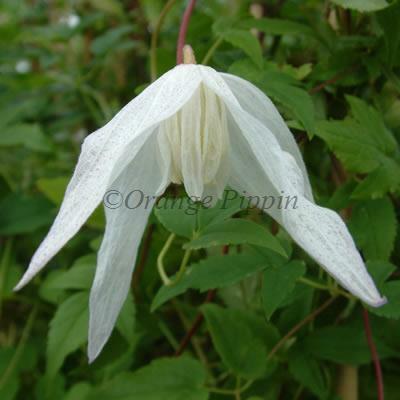 Clematis alpina 'Broughton Bride' has white flowers with long nodding petals, cream in bud and are covered in mauve speckles on the outside, cream inside. The first flush are produced during spring then again as late as July when they open up double, and have been said to resemble tiny ballerinas. These delightful flowers are also very attractive to bees and butterflies alike. 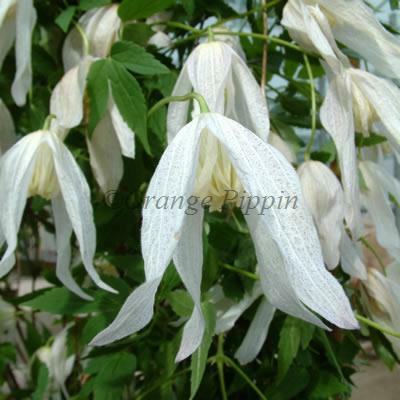 Clematis alpina 'Broughton Bride' was raised by Vince and Sylvia Denny of Denny's Clematis Nursery, Broughton, England and was named in 1998. It was a second or third generation seedling selection of open-pollinated Clematis koreana seed obtained from Dortmund, Germany in 1987. This easy to grow, non-evergreen climber can be grown up a trellis, along a fence, wall, pergola, archway or even to cover an unsightly building.